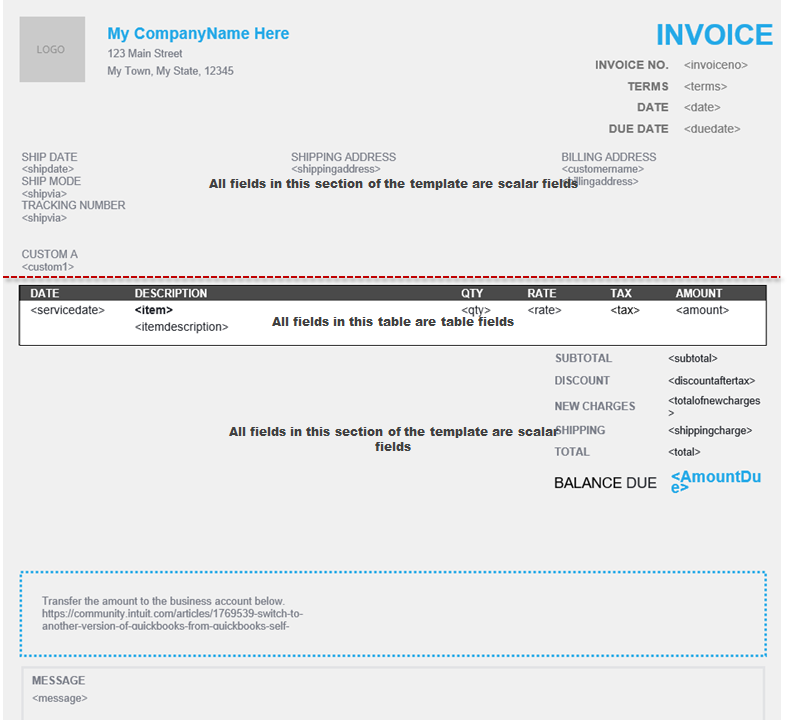 Learn how to import custom form styles for your invoices or estimates. 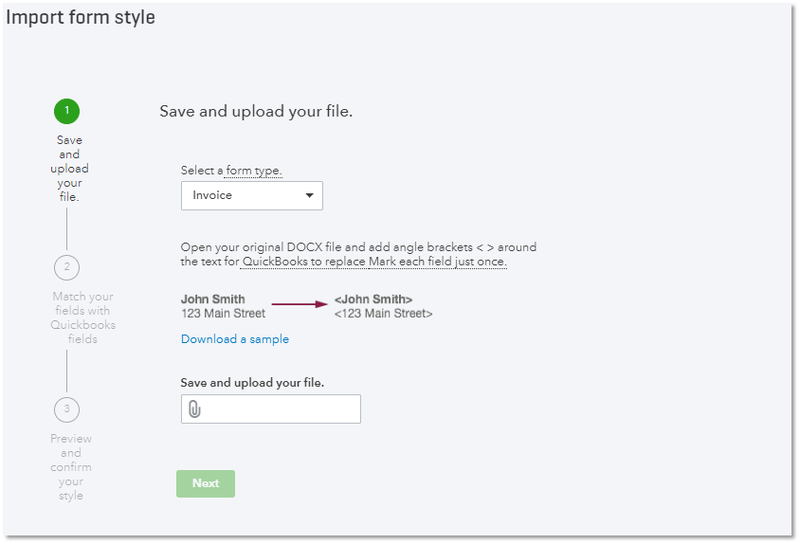 QuickBooks Online lets you import custom form styles in DOCX format from Word. Here are some guidelines and steps for designing, mapping, and uploading your form. Know the do's and don'ts when designing your DOCX template. Learning these basics can go a long way towards perfecting your custom form. QuickBooks Online uses a set of known keywords (or fields) called EZ Map fields. As you upload, QuickBooks looks for text enclosed in angle brackets (<>) in your DOCX template. QuickBooks does this to identify which parts of the template are dynamic, and then matches those parts with QuickBooks fields. This eases the mapping of your custom form. For example, using keywords <shipdate> and <shippingaddress> allows QuickBooks to match your fields correctly with QuickBooks fields Ship Date and Shipping Address. As you design your template, identify text or fields that don’t change with each print. Logos, company information, certifications, and such are static info. Make it part of your template. QuickBooks supports two kinds of fields: scalar and table. Scalar Fields are fields independent from each other and don’t repeat. You can place scalar fields separately or within tables. Don't use scalar and table fields in the same table. Table Fields are fields that repeat and go together as part of a larger group of information. For example, fields that make up an Activity Table or Account Summary on invoice. Always place table fields inside tables. Table fields placed outside a table will extract data from the first row of fields. For the purpose of the template, you only need to map the first non-header row in the table. QuickBooks ignores all other rows. Don't mix table fields that belong in different tables. For example, don't mix Activity Table fields with Account Summary fields. Download the entire QuickBooks Online EZ Map Fields Catalogue here. Already have a custom design in DOCX format (MS Word 2010+)? You can proceed to mapping it with EZ Map Fields. If you want to start fresh, we recommend using our samples. Download them here. Here are the fonts you can use in your custom form. More supported fonts are on the way. These file types may cause issues when uploading your custom form. Be sure to avoid them. You need to do these in your DOCX template. Identify non-static content in the template. Note: Go over the do's and don'ts of mapping in the "Design your custom form style"section of this article. Replace all fields with scalar or table fields, as appropriate to your chosen form type. Make sure all fields (text enclosed in <>) match the EZ Map fields defined in the EZ Map catalogue. Under Your Company, select QuickBooks Labs. Find the Import Styles plug-in, then turn it on. At the top right, select the New style drop-down, then choose Import style. You don't need to perform any further mapping if you used EZ Map fields. But you can easily change the matched QuickBooks fields if you choose to. Verify that your template fields match correctly with QuickBooks fields. You can change the QuickBooks fields if they don't. Select Next if everything looks good. Before you save, preview your style to make sure it looks exactly the way you want it. If you're satisfied with how your style looks, select Save and name your style. To make changes, either select Back or edit the file in your DOCX editor and import it again. Ready to use your custom form style? Start creating invoices or estimates with your style now. size_validation_error Your file is too large to upload. Make sure your document is less than 2MB. Fetching preview failed An attempt to create a preview of your style failed. Check for angle brackets applied in the wrong place or applied incorrectly. Try to reduce fields marked with brackets until Preview succeeds and then add them back in one at a time to isolate the mapping error. Save Mapping failed The selected mappings could not be saved. Try again or contact support. No Mapping found QuickBooks couldn't find any field that required mapping. Make sure to use angle brackets (<>) for elements on your template that should be mapped to QuickBooks fields. Multiple Page Document The document uploaded has multiple pages. Make sure your document only has one page. Here are answers to commonly asked questions about importing custom form styles. Certain fields are expected to be inside tables. For example, line item info like Quantity, Product, and Price are tabular (or table fields) and should be inside tables. Make sure to map these fields inside tables in your DOCX file. Learn more about table fields in the "Make mapping pain-free" section of this article. Some data are not appearing in the printed or preview document. Why? Your Master form style decides how data is handled and shown in all your forms. 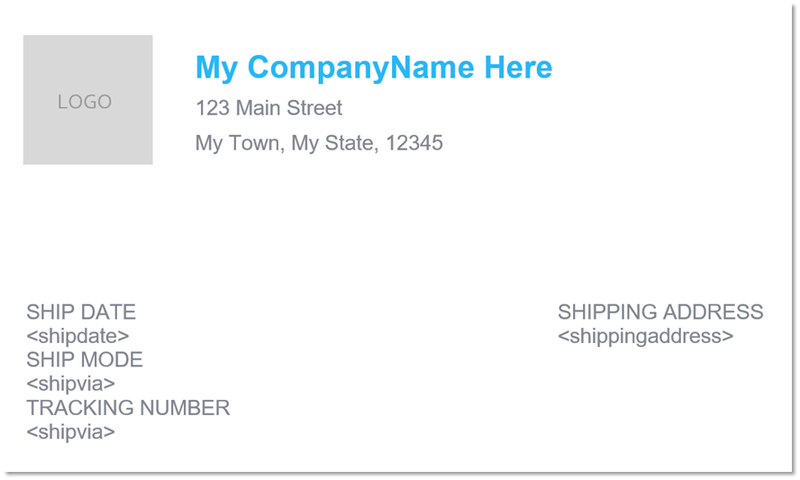 For example, if the "Form numbers" field on your Master form is unchecked, your invoice number won't appear on your custom form styles, regardless if you added it on the invoice. Find the Standard template (Form Type is Master), then select Edit. Customise the template as you desire, then select Save. Your data should now appear in your imported style. Is there any restriction on what I can upload? You can only import Word (.docx) documents under 2MB. Can I upload a style with multiple pages? Custom form styles with multiple pages are not supported. However, your final invoice can take multiple pages depending on the amount of line items you enter. Can I download my imported form style? You can save a PDF copy of your custom form style. However, you can't download them in their original DOCX format. What you can do is to save a local copy of the template you uploaded, and take a quick note of the mappings you made. Do I have to have a field mapped to import a style? Yes. The style you want to import should have at least one field that has to be mapped to QuickBooks fields. Why are tables in my style not printing right? Always keep your table layouts separate. Tables placed inside of tables, or merging and splitting cells can cause unexpected results. Try using tables with simple rows and columns.